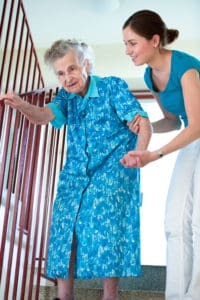 Are you or a family member having trouble getting up and down the stairs at home? It may be time to consider an alternative option. Stairlifts will make it much easier and safer to navigate the stairs without having to move to a more accessible home. A stairlift, also known as a chair lift or stairway lift, is starting to become the most common solution for those who are no longer able to safely navigate the stairs. Most people prefer to stay at home because of the comfort and security it provides them. Safety is often the most common reason why people have a stairlift installed in their home. Aging or living with a disability makes it difficult to navigate stairs. The installation of a stairlift will instantly provide a safe way to access all levels of a home. Some may think that walking up and down the stairs is a good way to exercise, but that is not true for people who have limited mobility. One missed step while climbing up or down a staircase can result in a serious injury. Everyone enjoys being independent, especially at home. When the stairs are no longer manageable for people, their independence is taken from them. Bedrooms are often moved to the first level and the basement is no longer accessible. However, with the addition of a stairlift, independence can often be restored and folks don’t have to feel like they are a burden to their family. In addition to increased safety, a stairlift also provides convenience and comfort. You don’t have to stress about climbing the stairs. A chair lift will give you a safe, relaxing, and smooth ride to the upper level of your home. If something is forgotten upstairs, you won’t have to worry about how you’re going to find enough strength to climb back up the stairs. These lifts are most commonly used by people who need to safely get between the levels of their home; however, stairlifts can also be used to move laundry baskets up and down the stairs or boxes that are hard to carry. If you are considering getting a stairlift in your home, give us a call to schedule your free consultation. We can evaluate your needs and answer your questions. Installation time is quick and non-disruptive. At Mobility Access Options NW, we will help you make the decision to make your life easier with the help of a stairlift.